Don’t forget about pest control in the fall and winter months! The need for warm weather pest control is obvious to most, but as fall approaches and warm weather starts to wane, many homeowners mistakenly see less value in continuing with pest management efforts. If you terminate pest control services during the fall and winter months, you will likely find that the pests come back and you are right back to where you started. A proper year-round program takes into account the seasonal behavior of pests, many of which instinctively seek out shelter as the weather becomes less comfortable outside. Seasonal pests such as rodents, cluster flies and stink bugs are extremely skilled at gaining entry. The options for dealing with many of these pests are limited once they become entrenched inside, so keeping them out in the first place is always the best approach. The qualified pest management professionals (PMPs) at Modern know about the obvious and not-so-obvious pests that are not only a nuisance, but can be potentially harmful, and will work with you to develop an effective past management program to control these pests throughout the year. Common fall pests include mice, rats, squirrels, cluster flies, lady beetles, western conifer seed bugs, stink bugs, spiders, and wasps. Your home is vulnerable in the fall. Don’t make the common mistake of stopping pest services during this time for year, a mistake that could easily lead to more serious pest problems. As fall turns to winter, homeowners who live in colder climates, such as New England, may believe that the snow on the ground and below-zero temperatures themselves eradicate all pests. But the cold air outside doesn’t stop pest activity. In fact, freezing temperatures provide a very strong impetus for many pests to actively seek shelter inside—warm, cozy homes provide an ideal environment for pests to thrive and multiply. Common winter pests include mice, rats, squirrels, cluster flies, western conifer seed bugs, brown marmorated stink bugs, spiders, and lady beetles. Any of these pests can freely move in during the winter, set up residence and create problems throughout the rest of the year. An effective pest management plan during winter months will provide defensive measures to limit the chances of pest invasion. 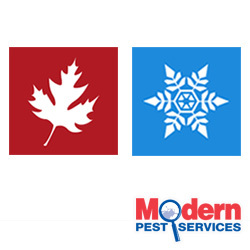 Modern’s HomeCare Green Program is comprehensive, year-round pest management program that includes a thorough inspection inside and outside the home, carefully targeted seasonal treatments, non-chemical monitoring and exclusion techniques. Working with our licensed PMPs and employing an ongoing pest management program will ensure that your property is protected from pest infestations year round. Modern’s Wildlife team can help protect your home from nuisance pests such as bats, squirrels, raccoons, skunks, woodchucks, chipmunks, moles, and even birds and we also offer Termite, Bed Bug and Mosquito/Tick control for additional pest protection. To learn more about protecting your home and family from pests year round, contact us today at 1-888-997-3312 or click here to request more information about our New England pest control.